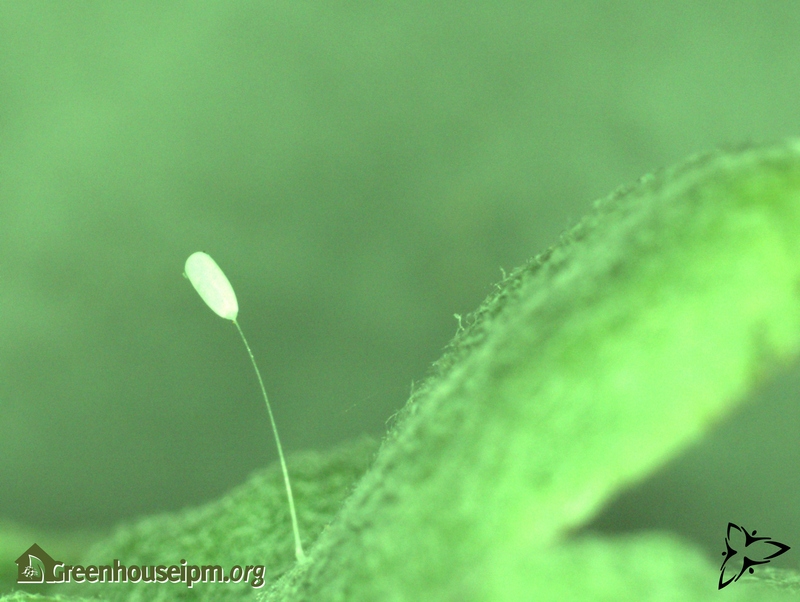 Green lacewing larvae are voracious predators with a strong preference for aphids, and are useful for cleaning up aphid hotspots when pest pressure is higher. They are typically shipped as larvae, and since larvae cannot fly, product must be distributed where the aphids are located in order to be effective. Larvae are oblong, mottled grey-brown, 2-10mm in length, with long pincer-like mouthparts. Their appearance is often described as resembling that of an alligator. The adults are pale green, with very large, delicate, transparent wings, and are up to 2cm long. 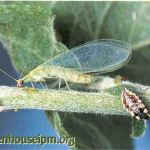 Green lacewing larval stage lasts 15-20 days, in which time they can consume over 500 aphids. 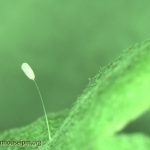 They are also known to opportunistically feed on other pests they encounter, such as thrips, spider mites, whiteflies, mealybugs, and caterpillar eggs. The larvae will spin a silk cocoon in a hidden spot on the plant and pupate. Adults will emerge after approximately 2 weeks. The adults feed only on pollen, nectar, and honeydew. The adult female will fly off in search of prey, where she will lay her eggs. A single lacewing female can lay several hundred eggs, which will hatch in 3-6 days after laying. 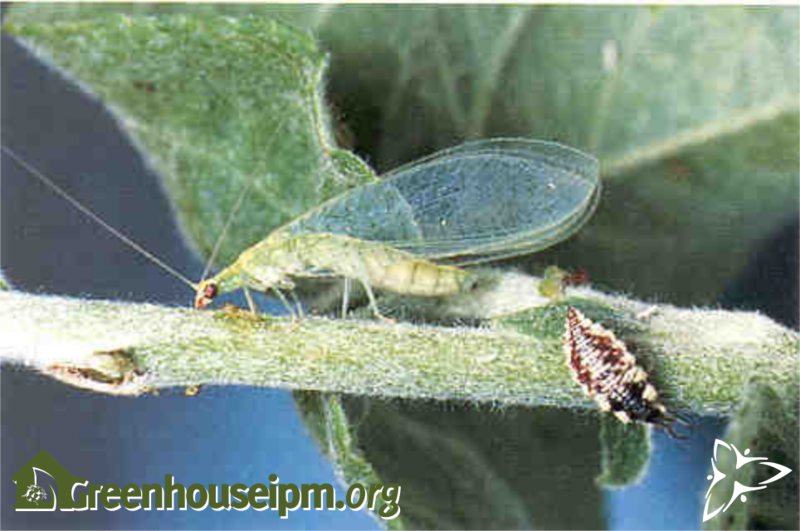 Unfortunately, adult lacewings will often leave the greenhouse in search of food and suitable places to lay their eggs. Lacewings work best when aphids numbers are higher, and should be introduced into hotspots. If you release them before aphid populations are high, the larvae may not get enough to eat and may not survive. Refer to the Quality Assurance of Biocontrol Products to determine the quality of lacewings at receipt at the greenhouse. Please consult Quick Reference Guide to Registered Pesticides for products registered in Canada. Koppert and Biobest also have pesticide compatibiliy information listed on their websites.